Geezer Skier: Geezer Ski Boarders? Recently I have been speculating whether there are or will be geezer ski boarders. I have yet to see what I think would be a 70+ ski boarder on the slopes. Perhaps there are some on the many slopes of the world but I doubt that there are more than a few hundred if that much. Since snow boarding is a relatively new sport by measures of long time geezer skiers, maybe it just will take another decade to age the boarders into geezerhood. However, I doubt that 70+ people are equipped to take the falls to knees and butts that are common with the boarding activity. 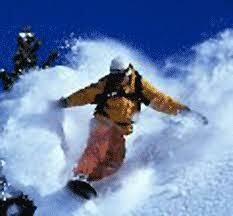 Some of us geezers have talked about trying boarding but have concluded we would not survive the learning curve. We are at the point of minimizing our falls! The other day I saw what might be a glimmer of the future of the senior boarders. As I was waiting to get on the triple chair I saw a father and two young sons all on boards line up to take off. Who knows? Perhaps 30 years from know those grown up boys and their geezer father will all be hanging out on the slopes on their boards. Meanwhile, I'll stick with the skis. Thank you very much!